There are 10 games on the National Hockey League slate tonight, highlighted by the defending Cup champion Capitals visiting Connor McDavid and the Oilers in late-night action. Before we get into the breakdowns, picks (yes, we’ve got a couple of bets tonight) and opinions, we wanted to thank everyone for the great feedback we’ve received so far this week on our survey. In case you haven’t seen it yet or had a chance to fill it out, we’re trying to determine the future of our website for 2018-19 and beyond, and getting your input on what you like/don’t like and how you might support the site is a big help. The survey is here if you haven’t provided feedback yet. Alright, onto tonight’s action where we’re going with a couple of bets. 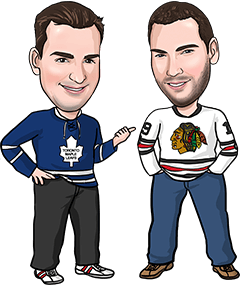 Check them out below, along with stats, info, trends and analysis for the rest of the NHL slate as well. Reasons to bet Montreal: The Canadiens are 4-0-1 in their last 5 games and have lost just once in regulation this season. Buffalo is playing its first home game following a 5-game western road trip. Reasons to bet Buffalo: The Sabres went 3-2 on that trip, outshooting their last 2 opponents by a combined margin of 71-48. Reasons to bet Columbus: The Blue Jackets have won 12 of their last 16 games following a loss of 3+ goals. St. Louis is only 1-2-1 at home. Reasons to bet St. Louis: The Blues have scored 8 goals in their last 2 games, going 1-0-1 against the Leafs and Jets. Columbus has allowed 23 goals in its last 5 games. Reasons to bet Philadelphia: The Flyers are averaging more than 4 goals per game on the road this year. Boston has had just one day off since returning from a 4-game road trip. Reasons to bet Boston: The Bruins are 4-0-1 in the last 5 meetings and have won 21 of the last 28. Philadelphia has lost 8 of its last 9 trips to Boston. Reasons to bet Nashville: The Predators look to bounce back from Tuesday’s 5-4 loss at home to San Jose, when they blew a 4-2 third-period lead. New Jersey has not played since Saturday. Reasons to bet New Jersey: The Devils have won 3 of 4 home games this season. Nashville’s power play is just 3 for 31 this season while the Devils have allowed only 3 power play goals in 6 games. Reasons to bet LA: The Kings have won 4 of the last 5 meetings, scoring 4+ goals in each of those contests. Minnesota has not played since Saturday. Reasons to bet Minnesota: The Wild has won 3 straight overall and is 3-0-2 at home. The Kings have scored only 7 goals in their last 5 games and have tallied 2 or less in 7 of 9 games this year. Reasons to bet New York: The Rangers have earned points in 4 of their last 6 games (3-2-1). Chicago is playing its 4th game in 6 days. Reasons to bet Chicago: The Blackhawks have scored at least 3 goals in 8 of 9 games this season. New York has scored only 5 even-strength goals in its last 4. Reasons to bet Anaheim: The Ducks have held 8 of their first 10 opponents to 3 goals or less. Dallas has allowed 22 goals in its last 6 games. Reasons to bet Dallas: The Stars should bring full focus here in their last home game before a 6-game road trip. Anaheim has been outshot by double digits in 8 of its 10 games this season and by a margin of 107 shots in its last 7. Reasons to bet Pittsburgh: The Penguins have earned points in 5 straight games (3-0-2) and are 2-0-1 on the road. Calgary has been outshot 116-76 in its last 3 games. Reasons to bet Calgary: The Flames are 5-0-1 in their last 6 games versus Pittsburgh. The Penguins are allowing more than 40 shots per game on the road. Reasons to bet Washington: The Caps are filling the net early, scoring 14 goals in their last 3 games and 4+ in 6 of 8 games this year. Edmonton has 1 regulation time victory in 7 games this season. Reasons to bet Edmonton: The Oilers are 3-1-1 in their last 5. Washington has surrendered 3+ goals in 4 of its last 5 games, allowing 7 power play goals during that span. Reasons to bet Vancouver: The Canucks have won 5 of their last 7, including a 3-2 shootout win last night in Vegas. Arizona just returned home from a 4-game eastern road trip. Reasons to bet Arizona: Excluding a 5-3 loss Saturday in Winnipeg, the Coyotes have allowed 10 goals in their last 6 games. Vancouver is playing for the second straight night, 3rd in 4 and 4th in 6.